Sleeping in the trees! 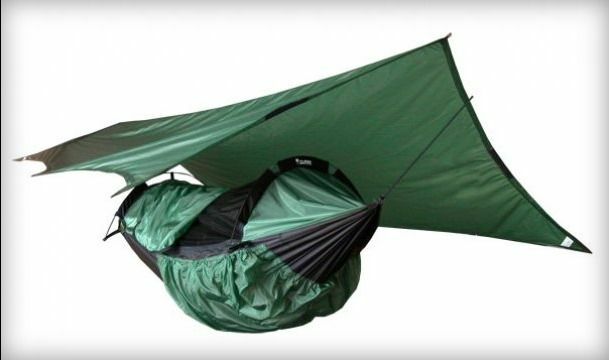 With the Clark NX-250 Jungle Hammock, you’ll have a happy, comfortable slumber. This compact little bundle (only 3 pounds 12 ounces) has plenty of well-thought-out features including 6 large pockets located under the hammock bed that hold your gear as well as provide pockets of air to insulate your body against the cold, 2 small interior pockets for your flashlight, phone, and other essentials, an independent, extra large, waterproof rain fly that can be closed off at the ends for added wind/weather protection, and a built-in pocket and compression sack to store the hammock. The included flexible poles are sturdy and allow for a spacious interior – room for someone as tall as 6’10” with a weight of up to 300 pounds! Your perfect 4-season camping shelter.